This week I am finally getting around to testing out the OPI Infinite Shine system. I've had these for awhile now, but I always put off doing wear tests, mostly because I get bored of wearing the same color for more than 2 days, LOL! 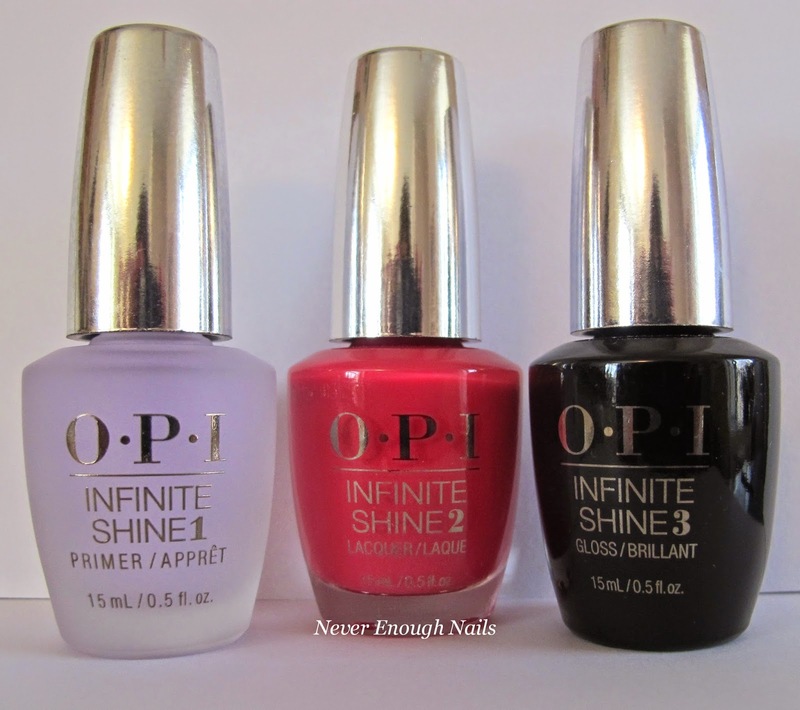 OPI Infinite Shine is a three step gel-hybrid system. The polish is supposed to wear for 10 days with a brilliant shine, and it applies/removes like a normal polish, no curing under a lamp. The first step is a Primer that prevents staining and increases polish durability. The second step is the color and there are a TON of fantastic colors to choose from in the Infinite Shine line-up. The final step is the Gloss that protects the mani and adds the crazy shine. 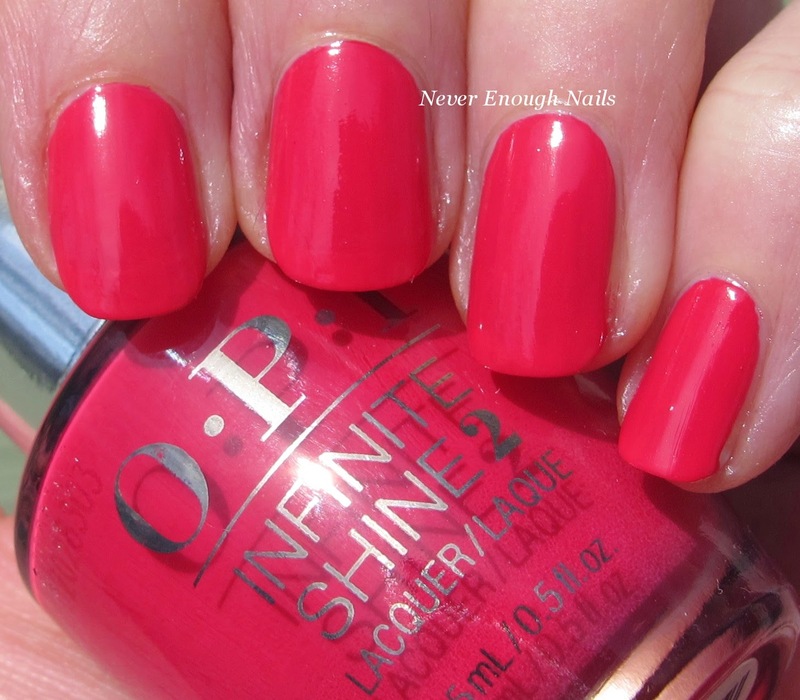 Today I'm wearing OPI Running with the In-finite Crowd, a bright fuchsia creme. This is a gorgeous blue-based hot pink. I've gotten a ton of compliments on it this week. It's a really eye-catching pink and it's SO shiny! It definitely has the appearance of a gel mani in terms of shine and smoothness. Running with the In-finite Crowd applies beautifully. It has a gel-like consistency that is easy to control. I used three thin coats for this mani. The Primer and Gloss were easy to apply as well, and I found the whole mani dried fairly quickly, considering that the final step isn't a quick dry top coat. I am testing this shade for wear right now, and I do want to do a second wear test just to confirm my results. But in a few days I will have swatches of the four other OPI Infinite Shine colors I have, as well as a report on the wear time. I do consider wear time to be a VERY individual factor and I typically don't report on it at all. But for a system like this, where part of the appeal is the long wear time, I do think I need to test it out for you! The OPI Infinite Shine Gel Effects Lacquer System is available now at professional salons, including Ulta, Ulta.com, beautybrands.com and more.